In Ella's Element: Lola Had Puppies! Hello everyone! Another Monday is here so I thought I would share some good news with you to hopefully cheer you up. For those of you who don’t know Lola is Dan’s mum’s Chihuahua. When we arrived at the flat Lola had been pregnant for quite some time and it was only a matter of a few weeks before the puppies were on the way. Lola decided to have the puppies on a Monday afternoon while we were alone in the flat so it was down to just Dan and me. I must had known this would happen as all of the week before I had been researching what to do when the labour began. So I was as prepared as I could be. Of course I was still terrified when it all began but I kept my head and made sure that Lola was warm and comfortable. Lola was amazing especially for a first time mum. She did most of the work and I only had to intervene once to cut the last umbilical cord. Yes there is something I never thought I would say. The birth was both fascinating and disgusting all at once. I'm stealing a little of Lola’s thunder hear but I was proud of myself that I managed to keep calm and help Lola. If anyone had told me a few months ago I would be helping a Chihuahua give birth I would have laughed so hard. 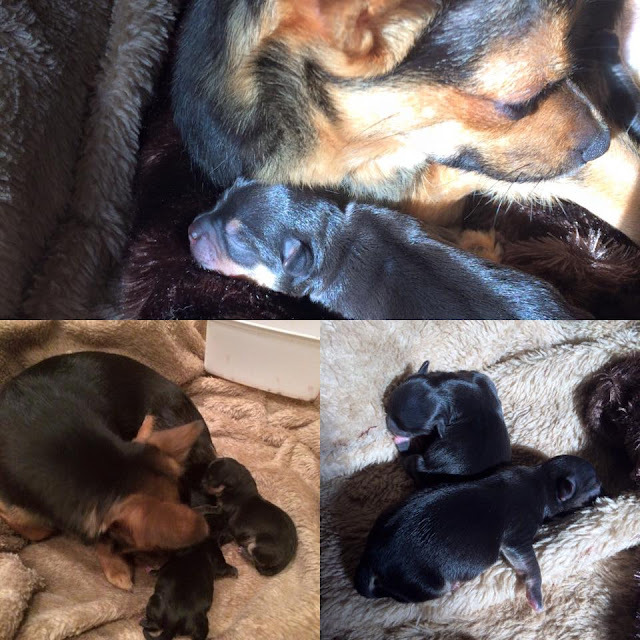 The birth went very smoothly and Lola gave birth to three puppies (two boys and one girl) while researching I came across a number of horror stories about some of the puppies or even the mother not surviving the labour. Luckily all of the litter and Lola are well and happy, they are currently all snuggled together enjoying some of the sunlight coming through the windows. I hope you all enjoyed this post and it put a smile on your face this Monday morning. Have you ever seen a birth? Has your dog ever had puppies? I know they are so sweet! Aw thank you I'm surprised I managed to stay calm to be honest. Oh wow delivering a calf sounds amazing! Well done you! Aw thank you gorgeous! I know they are so cute, thank you my beautiful friend I hope you have a lovely rest of the week too!